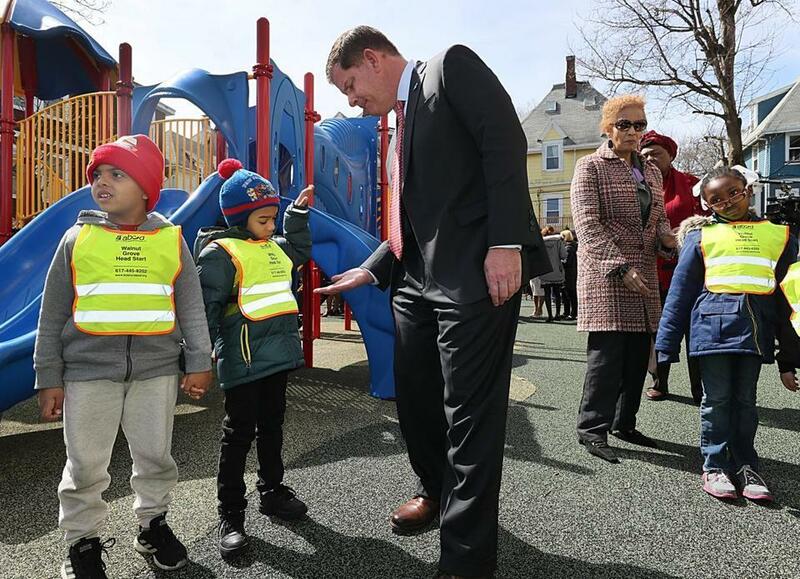 Boston will fully fund prekindergarten for 4-year-olds within five years, fulfilling a 2013 campaign promise by Mayor Martin J. Walsh to provide quality early education for some of the city’s youngest residents. “This is a game-changer for the young people of our city,” Walsh said Tuesday, surrounded by school administrators and representatives from community groups set to partner with the city to extend pre-K programming. If completed, the long-awaited initiative would put Boston on par with other major cities in the Northeast that offer educational programs to all of their 4-year-olds. Walsh said the city will direct $15 million from next year’s budget, which begins July 1, into a “Quality Pre-K Fund” that will be used over the next five years to pay for high-quality seats at city schools and community groups that have partnered with the city. High-quality pre-K programming is led by teachers who have degrees in early childhood education and earn the same starting salary whether they work for the public school system or community groups; the programming must be accredited and follow national curriculum models, with appropriate teacher-to-student ratios. The city and community groups already provide high-quality pre-K programming to almost 3,200 children. Officials have identified the need for the additional 750 high-quality seats — a deficit that has narrowed by half under Walsh — to ensure that all 4-year-olds have access to the same level of programming. Laura Perille, the interim schools superintendent, said Tuesday that the funds will expand public schools’ partnership with community groups and ensure parents have options for their children closer to home with the same quality education students receive elsewhere in the city. “It is this mixed delivery model that allows us to meet all of our families with what they need,” she said at the announcement at ABCD Walnut Grove Head Start, which offers high-quality preschool in Dorchester. High-quality pre-K programming was a staple in Walsh’s 2013 campaign for mayor. In the years since, though, securing funding for the initiative has proven to be more difficult than projected. Walsh first floated the idea of selling City Hall to pay for programming, though that idea never took root. Later, Walsh’s request for state approval to use surplus funds derived from Boston tourism tax revenue went nowhere. Boston fell behind cities such as Philadelphia, which imposed a tax on sugary drinks to pay for early education in 2017. New York City’s prekindergarten program, which started in 2014, now enrolls 70,000 youngsters, and that city’s mayor is seeking to expand early childhood education to 3-year-olds. Boston wasn’t far off: A report the mayor commissioned found in 2016 that 90 percent of the city’s 6,000 4-year-olds in any given year attend pre-K, either through the public system or at private schools. But not all of them receive high-quality programming. The $15 million in funding will close that gap over the next five years, setting up classrooms with properly trained and compensated staff in schools and community organizations across the city. Walsh said he would then sustain funding for the programming under the yearly public schools budget, which is projected to top $1.3 billion next year. Those who attended the announcement and spoke of the need for the programming included Chaokee Calderon, who said she and her husband work full time, and found it difficult to help their 4-year-old daughter, Khailee, with the “little things” to improve her education. So she took her to the ABCD Head Start Walnut Grove in Dorchester, a city partner, where she has excelled over the last seven months, Calderon said.